Discovered in 1850 by Increase A. Lapham, this is the only known intaglio Effigy mound in the world. It was excavated for ceremonial purposes by American Indians of the Effigy Mound Culture about 1000 A.D. A part of the tail has been covered. Of ten other recorded intaglios, all now destroyed, eight were similar in representing the panther and two represented bears. 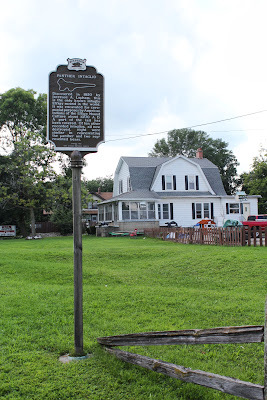 Marker is on Riverside Drive (Wisconsin Route 106), between Rock River Park and Wilson Avenue, Fort Atkinson, Wisconsin 53538. 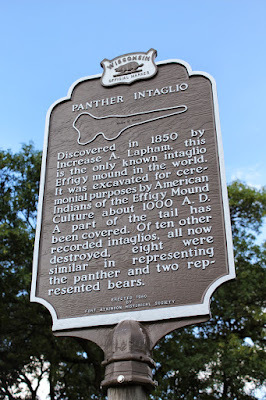 NOTE: Wisconsin's got the only intaglio effigy mound in the world!! Go Wisconsin!! NOTE: The marker had been reported missing; it has now been restored and returned to its location.